During the early 1970"s, the Toyota Motor Company of Japan ventured into the specialty car field, and soon established a reputation for producing cars with both quality and performance. 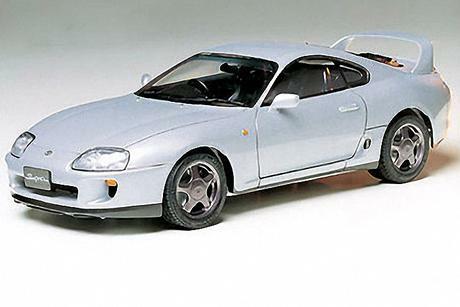 Their "Supra" series is often described as a re-creation of Toyota"s legendary 2000GT sports car, which was an excellent combination of high performance and elegance. Using their latest racing automotive technology, plus their uncanny design genius, the newly designed Supra made its sensational debut during February 1993. Massive and powerful are the words that can best describe this awesome specialty sports car. The top of the line Supra uses a 3-Liter, DOHC 24 valve, straight six cylinder, twin-turbocharged engine, capable of 320 horsepower and 43.6kg/m of torque. In contrast with the company"s previous Supra model, which had a very fluid styling composed of gentle curves, the new Supra has a bold dramatic appearance due to its wider body and larger 17-inch wheels. An oversized rear wing has been installed to improve downforce performance during high-speed cruising. This Supra"s newly refined suspension has one of the best road holding systems offered by any mass produced sports car, and with its ventilated disk brakes fitted at all corners, and the front end utilizing four piston calipers, it has unmatched stopping power. Toyota"s Supra is this company"s attempt to furnish a car that has uncompromised drivability, safety, high performance and relaxing comfort.